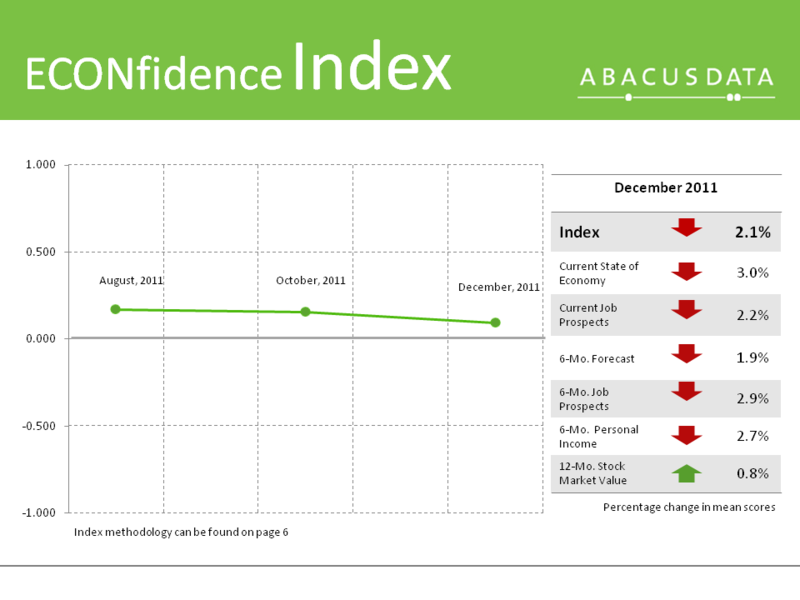 According to the latest figures from Ottawa-based Abacus Data’s ECONfidence Index, Canadian consumer confidence in the economy remains relatively stable in the face of global uncertainty. While most index components trended downward, leading to an overall drop in confidence of two percent from October 2011, decreases in all areas of the index were minor, leading to relatively stable confidence figures over the past five months. Of the six key areas tracked by the ECONfidence Index, worries about the current state of the economy and the prospects of jobs six months from now were leading contributors to the decrease, while tepid optimism about projected stock market values a year from now helped steady Canadian confidence. “Our index shows confidence in job prospects down slightly, but such a modest drop is encouraging considering the recent survey was in the field just after the government released the latest unemployment figures”, said Abacus Data’s CEO, David Coletto. The survey also tested how Canadians would fare if an emergency arose and they needed to come up with $1,000, comparing the results to a similar American study. Canadians were considerably more likely than Americans (57% versus 36%) to be able to produce the money from their checking or savings account. Of the remainder, most would borrow money from friends or take a cash advance on their credit cards. “Despite the small overall drop in confidence, these figures are somewhat encouraging”, said Coletto. “Canadians seem to be relatively unfazed by brewing economic crisis in Europe, and appear to be adopting something of a ‘wait and see’ attitude at home”. For each interval, Abacus Data conducts an online survey among at least 1,000 randomly selected Canadian adults, drawn from an online panel of over 150,000 Canadians. The December 2011 survey was conducted from December 2 to 4 and interviewed 1,004 Canadians. Since the online survey was not a random, probability based sample, a margin of error could not be calculated. The margin of error for a survey of 1,004 respondents using a probability sample is +/- 3.1%, 19 times out of 20. Results of the survey were statistically weighted by gender, age, region, language, and immigration status using census data from Statistics Canada. Totals may not add up to 100 due to rounding.